I have been to tropical places. I’ve admired the lush forests and gazed at the blue waters. But nothing could have prepared me for the for sights and sounds above the treetops in St. Lucia. The second port of call on our Caribbean Christmas cruise was this incredible island, bursting with vibrant plant life and more hues of green than I have ever seen. 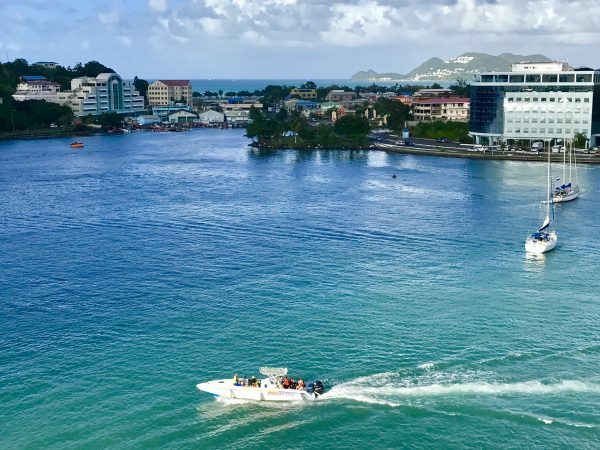 We docked at St. Lucia, the second largest of the Lesser Antilles’ Windward Islands, at about 8 a.m. When we opened the curtain to our veranda, we had a spectacular view of the island, surrounded with blue green waters and sailboats passing by. I knew it was going to be a good day. The view from our veranda in St. Lucia. For this stop, we had already booked a Celebrity Cruise excursion for an aerial tram where we’d glide above the rainforest on an open-air gondola. We picked this excursion because it was labeled “mild” for activity and we suspected because of my health, I may need a lighter day by this point in the trip. 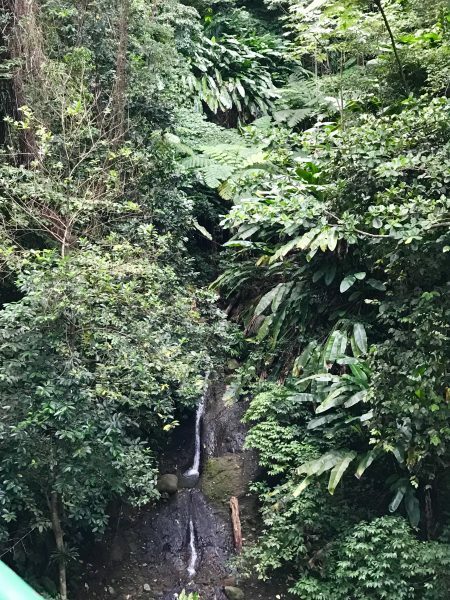 We took a van from the port to a rainforest reserve where we marveled at the lush flora and fauna. We boarded the open-air gondola, sitting two to a seat, and began our more than half an hour journey to top of the rainforest. 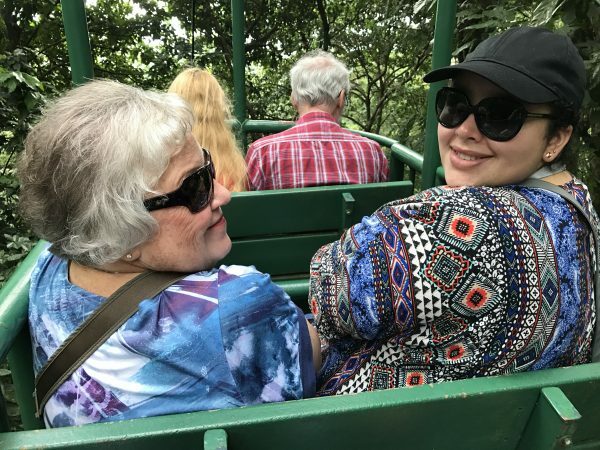 My mom and our daughter, Meghan, on the aerial tram to the top of the rain forest. Our tour guide was fantastic. She shared a brief history of the island, explaining St. Lucia was originally occupied by the Carib Indians and then had both French and British settlers. St. Lucia changed hands 14 times before it became a British Crown Colony by the Treaty of Paris in 1814 and remained under British control until 1967 when it became an independent state in association with Great Britain. In 1979, it was granted full sovereignty and became a full-fledged member of the British Commonwealth. 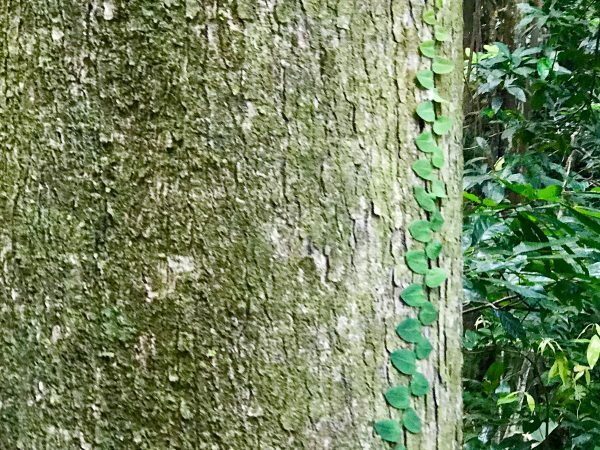 On our way to the top, our guide also pointed out the wide variety of plants and trees in the rainforest, including stunning views of gommier trees and the remarkable strangler fig. 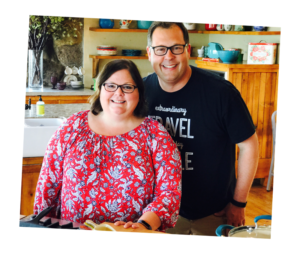 Here’s a short video clip so you can see and hear and what we experienced. We saw giant ferns and the magnificent Heliconia (bird of paradise). 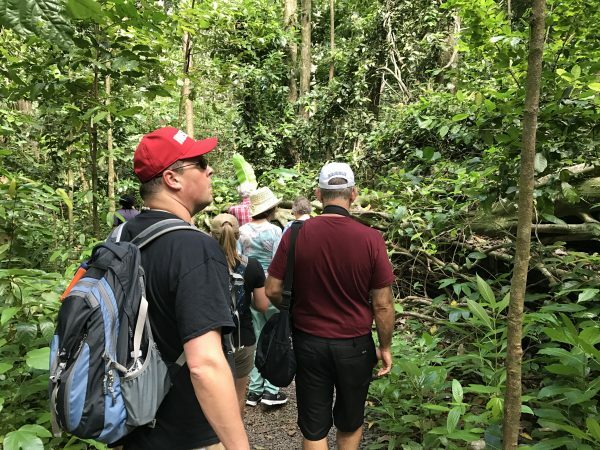 While our guide was thorough and answered our questions, she also spent long periods of time in silence so we could hear the sounds of the rain forest. It was incredible. 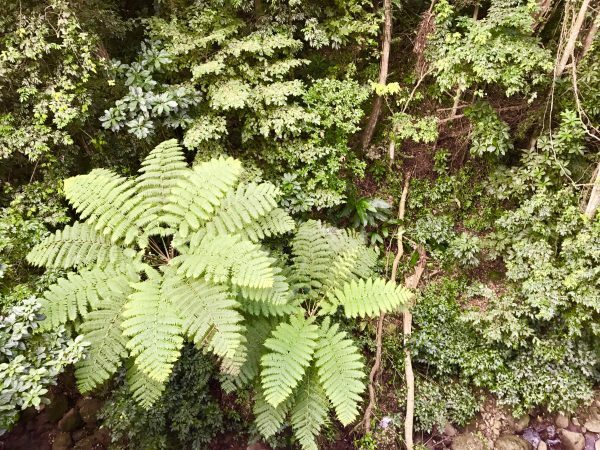 The giant ferns were absolutely amazing. Although it was a bit overcast that day, the view from above the tree tops was breathtaking. 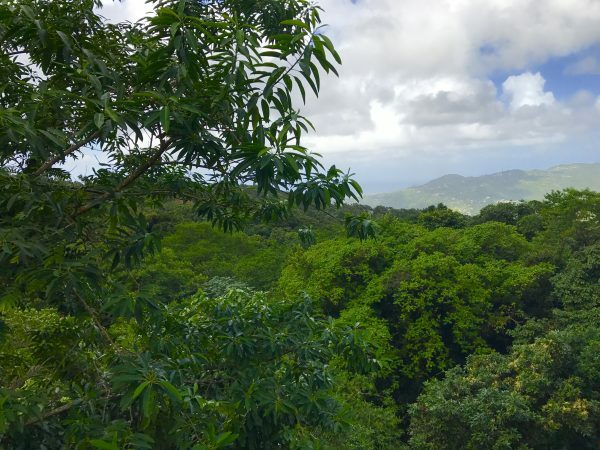 The view of the Caribbean sea from above the tree tops. We enjoyed the tram ride down the mountain, looking for hummingbirds and identifying the various trees and plants. None of us wanted the ride to end. At the bottom, we walked down a slight hill and the guide told us our tour also included a 15-minute hike in the rainforest. Our daughter, Meghan, who like seeing nature but not being in it, had her doubts about the hike and opted to stay behind. My mom, Steve and I agreed to take the short hike to take a quick peek at floor of the rainforest. 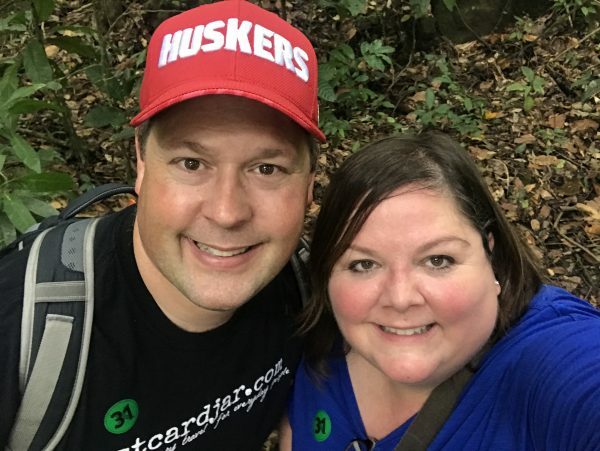 Our excursion labeled “mild” suddenly turned into “moderate” and five minutes later could have easily been considered “strenuous.” We climbed up dozens of tall, uneven steps in the forest, grabbing onto trees (and each other) to get from one level to the next. 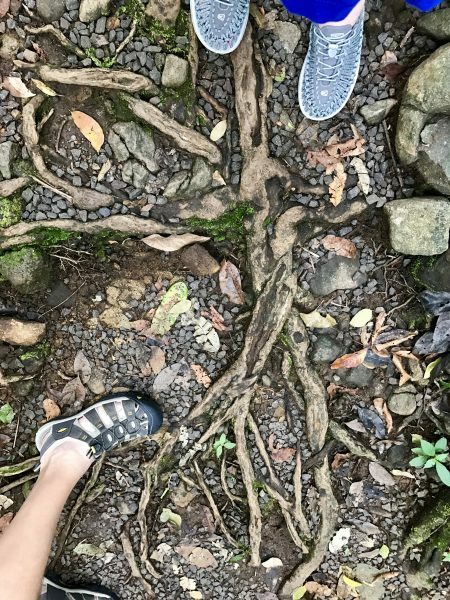 Our guide continued to talk about the trees around us, but I don’t remember hearing what she said or looking at any of them because my eyes were fixated on my feet and the hazardous ground below. Fifteen minutes in to our so-called 15-minute hike, we were all dying and looking for nearest escape. There was none. 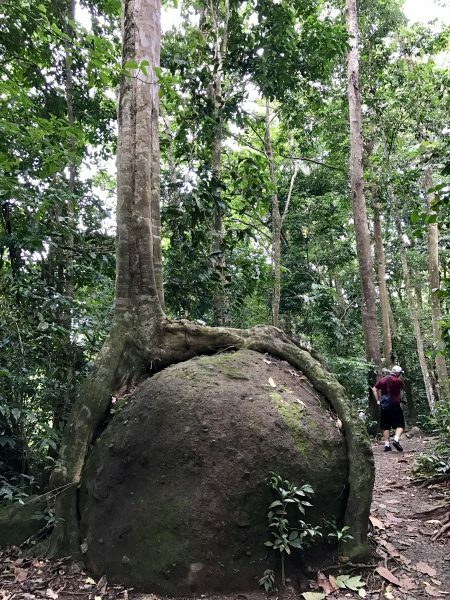 I didn’t have time to take many pictures on our hike, but I did stop briefly to get a shot of this unique tree/root/rock. You could barely hear the guide speak over the wheezing sounds of the tourists but we hiked on. Finally, we began to descend but then I realized the steps down were going to be even more difficult than the ones we’d just climbed. I told my quads to get get ready — today was apparently going to be leg day. It wasn’t easy, but I made it. We all did. Fortunately, we were greeted at the visitor’s center with a glass of cold and refreshing rum punch and then headed back to the ship. Next stop — St. Maarten.